What’s the difference between St. Peter’s Basilica, the Sistine Chapel, and the Vatican? Vatican City is a city-state with clearly defined borders. It is an independent country surrounded by Italy, and presided over by the Holy See (the Catholic church’s jurisdiction), with its own leader (the Pope), currency (Vatican-issued euro), security force (the Swiss Guards), post office, etc. Inside the walled borders of Vatican City are the Vatican Museums. These museums are vast and contain huge collections of art and stunning antiquities, and the world-famous Sistine Chapel. They make up a large part – but not all – of the Vatican buildings. The rest of the space within the Vatican’s city walls is made up of chapels, ceremonial spaces, offices, accommodation, the papal apartments, the Vatican gardens, restaurants, shops, a bank, an auditorium (in which Papal audiences take place), and even a radio station. These are not generally open to the public, though it is possible to go on a guided tour of the gardens. However there is also a small part of the Vatican city that is outside the walls and may be wandered into from the street. In this space is St. Peter’s Square (Piazza San Pietro) and St. Peter’s Basilica (Basilica di San Pietro) which is the world’s largest church. Confusingly though, they might sometimes mean St. Peter’s Basilica. Unlike the museums, Michelangelo’s stunning St. Peter’s Basilica is free to visit. 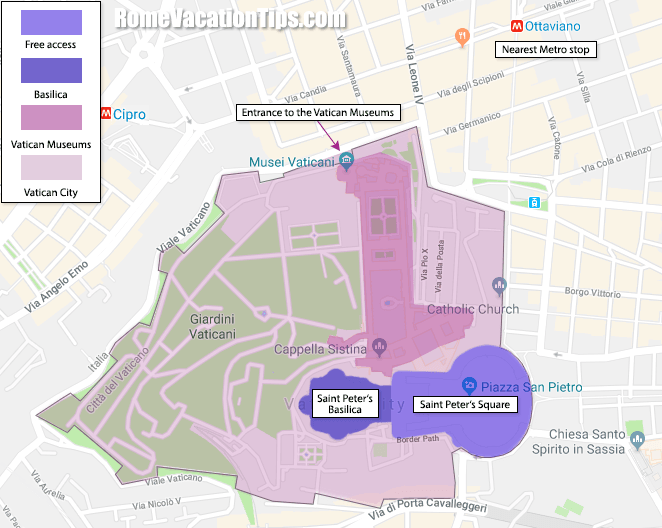 The largest church (it is not a cathedral) ever built has a different entrance to the Vatican Museums, about half a mile away round the city walls – you line up in St Peter’s Square to go through security check and enter the church through the front door. Please note that for any gender, shoulders and knees must be covered to be allowed entrance to the Basilica. During warm months people can and do get turned away regularly at the door for not covering themselves up, even after waiting in line for half an hour. If in doubt carry a pashmina or sarong to throw over yourself when at the clothing check. You can usually visit the Basilica in the space of just over 90 minutes, including waiting time (depending on how long the line is, which can seem ridiculously long, but usually moves quite quickly). However if you’re in a hurry, you can also skip the lines at St Peter’s. Finally note that since the Basilica is a working church, it is sometimes off limits to visitors; if you’re lucky though you may even see the Pope giving mass, or even giving the Papal Address to the crowds in St Peter’s Square – usually at 12 noon on Sundays. Related: what’s the best way to skip the lines at the Vatican?